You're like almost always guaranteed some fun when it comes to the variegated artists that wade in the warm shade of Japanese netlabel Tanukineiri's umbrella. Taking a pun for a name ("feigning sleep" but also "sleeping tanuki" – hence the label's Tom Nook-esque mascot), they've slowly infiltrated the minds and hearts of many an underground artist and listener; not least this faceless entity of mine called YES/NO. Moving on. Two artists affiliated with Tanukineiri have just collided in a rather spectacular fashion, or rather, many artists have collided with just this one in a remix extravaganza. 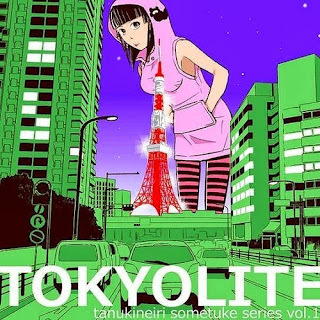 Songs from the Hello EP by Indonesian band Tokyolite (I wrote about their song 'Yes! Dance!' last year) have been remixed every which way by 20 – yes TWENTY – artists, including 食品まつり a.k.a. foodman and mus.hiba to name a couple of those with whom I'm more familiar. One particular remix really stood out to me and it has been on a loop for about half-an-hour because it's one of those golden-sunlight tracks: you never want it to end. Who's it by? Hiroto Kudo, that's who. I wrote about his song 'Magic Raincoat' at the height of last summer's heat and enjoyed his music very much. Now, confronted with this wholly awesome remix, I'm left gasping for breath as I watch the song tick away to its end before pressing play again. Taking the vocals from Tokyolite's 'Coba' (presumably named after the ruins of the Mayan city that go by the same name), Kudo twists them and squeezes them through his magical remix machine, giving them a multi-layered poignancy with their achingly delicious high-register and far-flung echoes above the spectral gusts of synth that whirl underneath. The track cascades with sundrip bleeps the whole way through and is soon, which is set to a dubstep-flavoured beat swaying as if through a blustering torrent of pent-up appreciation for beauty. Explosions of fizzy white noise erupt around halfway through, giving the track an unprecedented rush of energy and an exciting booming dynamic: a surprise gift in a shower of presents. To create this different a song from the original – a Latin-like, funky number – is really impressive. Hiroto Kudo's knack for creating fresh music is nothing short of brilliant; so I'm, and you should be too, expecting even more great things from him in the future.